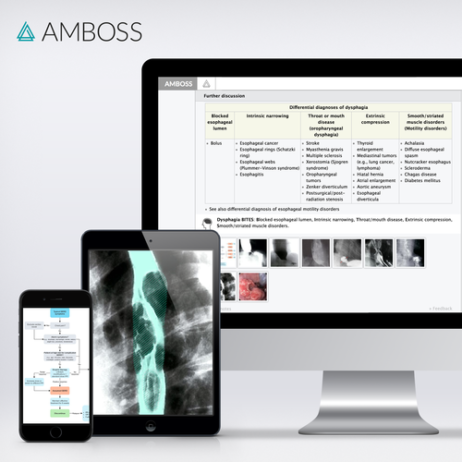 AMBOSS is the only resource that offers a robust, all-in-one study guide for the Step 2 CS – available both online and on-the-go with our mobile apps. It integrates seamlessly into the entire AMBOSS platform, which includes a full medical Knowledge Library and all the information needed for the USMLE™ Step 2 CS and CK. To help you excel during the physical examination portion of the Clinical Skills exam, AMBOSS provides suggestions for questions you should ask your patient, which can be found within the ‘history’ section of each library Learning Card. 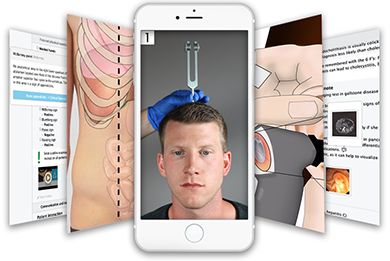 To simplify your exam preparation even further, we’ve included multiple videos and images that can be referred to if you’re unfamiliar with how to perform a specific examination maneuver. Features include detailed counseling suggestions and specific reasons why certain diagnostic tests should be ordered. Although the traditional book references used to study for the Step 2 CS, such as FirstAid® or Kaplan®, have been relied on by students and graduates for years, there are many advantages to using an online platform like AMBOSS. Specifically, digital platforms allow you to interact with multimedia that might be included in the exam, help you analyze your results to pinpoint knowledge gaps, and direct you to answers to questions you might have about signs, chief complaints, or differential diagnoses. In addition to working with the right resources, you might want to spend time practicing patient encounters with a partner. For students who might have less experience on the wards seeing patients, this helps ensure you’re checking all the right boxes for Integrated Clinical Encounters (ICE), Communication & Interpersonal Skills (CIS), and Spoken English Proficiency (SEP). This exam, unlike the other USMLE’s, is the only one where minor mistakes can really cost you points, and studying with a partner helps ensure you maximize your score. Some medical students study with friends or relatives who are not trained within the medical profession. However, most won’t know what “epistaxis” or “positive rebound tenderness” are and will have to ask what they mean before the physical examination even begins. For this reason, AMBOSS explains all abnormal examination findings in layman’s terms within the ‘patient instruction’ section to avoid any issues while preparing. For TIPS & TRICKS during the exam, visit the AMBOSS Step 2 CS Tips & Tricks Learning Card. For more information on AMBOSS for Step 2 CS, view our Blog.